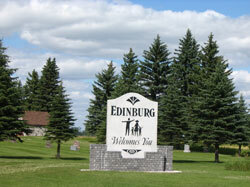 The Edinburg Welcome sign is such a nice addition to those coming into Edinburg from the South. 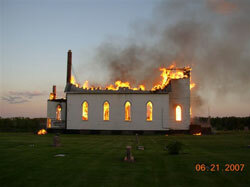 Hard to believe Memorial Day services will never be held in Odalen again. This is a picture taken from the north looking south. I received an email from Gunnar Nygard of Odalen, Norway. He has posted this picture on the District of Odalen's website in Norway. Blue skies, sightings of a couple of robins and the sound of a mourning dove makes me think it won't be long until garden seeds will go into our beautiful black soil. Canada geese are wending their way back to the north also. I enjoy their honking sounds as they pass overhead. Life is great in Edinburg! One of many museums in Japan.